with Registration and Wine Reception in the Royal Arthur Suite. Above, we see less than half of those in attendance. Saturday morning commenced at 10.00am with a meet-up in the Convention Suite, followed by films early afternoon and early evening. Sunday morning found us all on a Ramble around the Camp, looking for any building which those lovely 1990s 'developers' might have left standing. 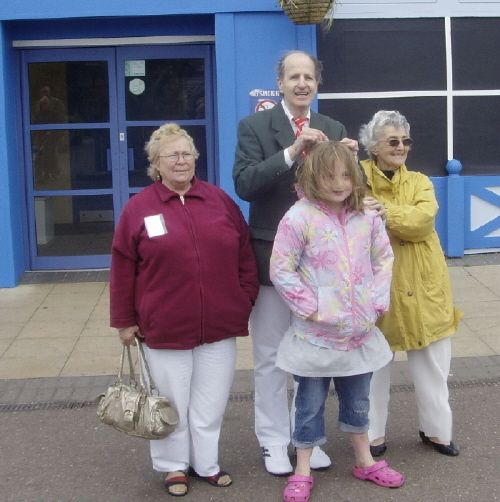 Here we are at the start of a 'Locations Tour,' looking for sites associated with Laurel and Hardy's visit to Butlins Skegness in 1947.
the lady on the left starts turning into an iceberg. Towards the end of the Ramble I was able to indulge myself in a further bit of nostalgia, and arranged with our kindly group to recreate a photo I'd had taken in 1973, outside the then Queens Showbar. Not a bad effort, is it? and my hair has gone down the plughole. Poor thing! plus one bemused child who was snatched from the passing crowd. At first glance, when walking around the Camp, it appears that all the pre-1986 buildings on the Skegness site have been demolished, except for the Queens Building and the Ingoldmells Hotel. However, there are actually a few more, although they are hard to recognise as they have been covered in cladding. Um!! Classy!! On the left is the Ingoldmells Hotel as it looked in its heyday. And here it is as it looks now. Progress, hey? Billy Butlin must be turning in his grave. Kelly Kelleher and her party of six girls. And when I say 'party - these girls really knew how to party. A really big 'Thank You' to all the Sons who came on the 'Stan & Olliday', at Butlins Skegness, over the 2008 May Bank Holiday. They were a real mixed bunch. There was a family of five, a family of four, several single males, and the rest was made up of couples. On top of that, they were sharing the Convention Room with a huge party of former Butlins' Redcoats. Was this one mix too many? - Not at all. Right from the Cocktail Reception on the first night, the Sons immediately bonded with the Redcoats, and even stayed on to watch the Redcoat Introductions. 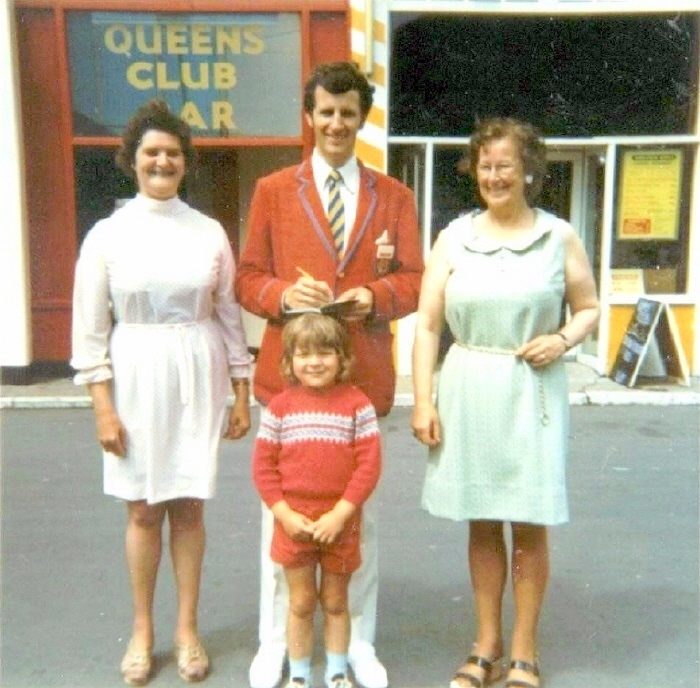 Some of the Redcoats returned the compliment, and attended the Laurel & Hardy Film Shows, and then, on Sunday morning, after watching a DVD of "Laurel & Hardy at Butlins," both parties again joined up for the "Locations Tour" of the Butlins Camp. Weeks on, I am still reflecting on what a super bunch they were. There was never any hint of an argument, no drunkenness, loudness, or chanting: just constant socialising, appreciating the films, and enjoying the company of friends old and new. It was heartening to hear, at the end of the 'Olliday,' many of the ex-Redcoats saying how much they had enjoyed the company of the Laurel & Hardy fans. I have been a member of the L&H fan club for over twenty five years, but I can honestly say, in all that time, I have never been as proud to have been associated with The Sons of the Desert as I was on this occasion. I could name names but, as the organiser, it would be wrong to have favourites - all of them had their merits, and I'll be delighted if every one of them comes to the next one. Our grateful thanks go to Eve and Ray Allen, and Rob Lewis, for the above photos. If you're not pictured here, that's because you haven't sent me any photos!! More photos will be added when I receive them.